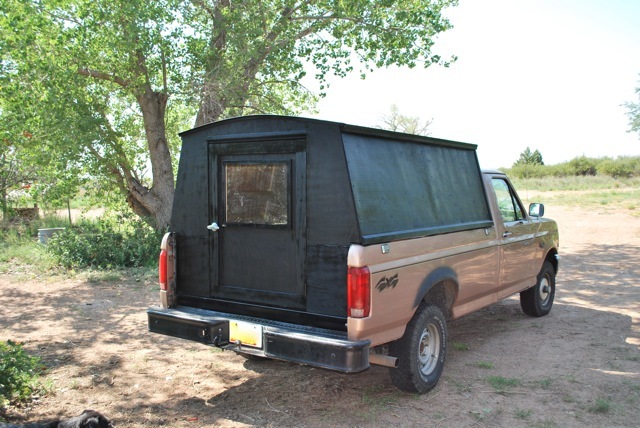 This is my home built camper. 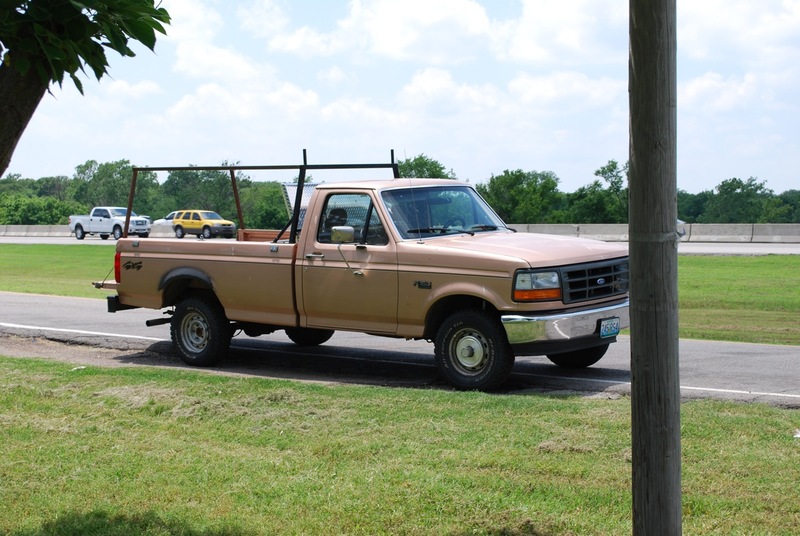 I have lived out of my truck for extended periods of time while working afield as an archaeologist. This project is a sort of homage to my Traveler ancestors. Between this and my cargo trailer, I hope to be fully mobile someday soon. Much of the inspiration for this comes from expedition vehicles I have seen on the web. If you have an interest in this sort of thing, check out the forums over at the Expedition Portal or the the IH8MUD.com site. The latter is focused heavily toward the Toyota crowd but still has some great information for the rest of us. 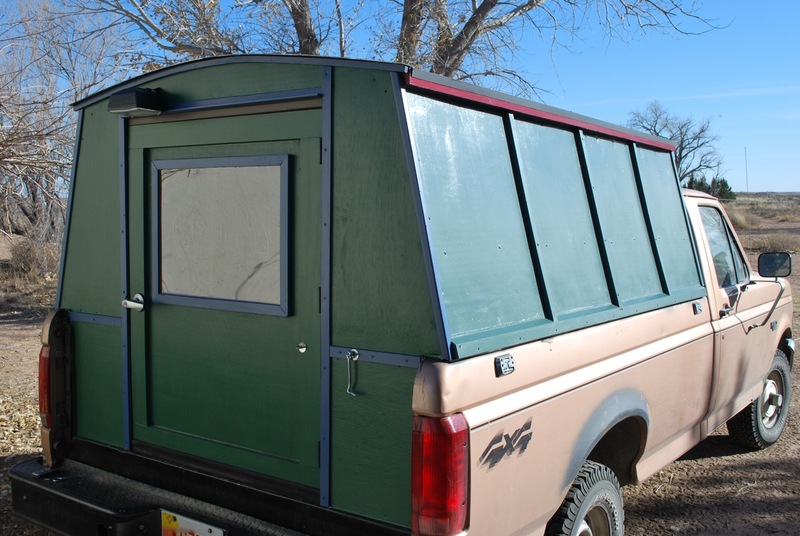 The frame is welded from 1.5″ square steel. Steel provides a very sturdy frame and relatively light weight. I kept the hardwood ribs very light weight, like an old time canoe. 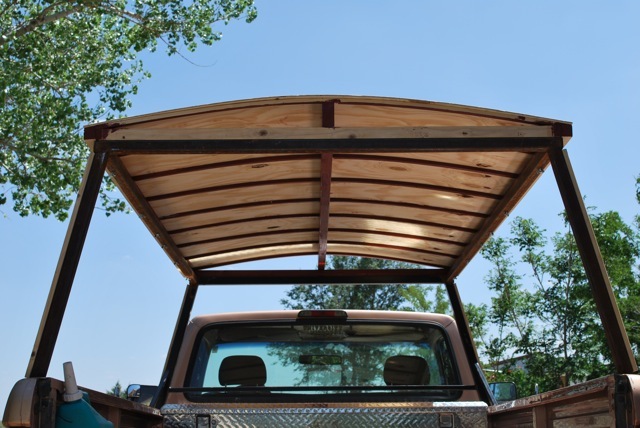 3/8″ plywood makes up the roof. I had to run the ridge down the center to alleviate the outward pressure from the sprung wood. The steel flexed outwards substantially under the stress and I didn’t want a cross-bar to hit my head on. Walls in place. I drove around like this for a while. It earned me many stares and questions. I had to make a quick trip to wet country so I added the rear wall and door. A quick coat of paint made it look like an Amish milk wagon. Outside ribs in place. Exterior is nearly done here. Base coat of paint. And a tractor/utility lamp that provides a huge amount of illumination for working or camp set-up. Roadrunner on the final paint job. 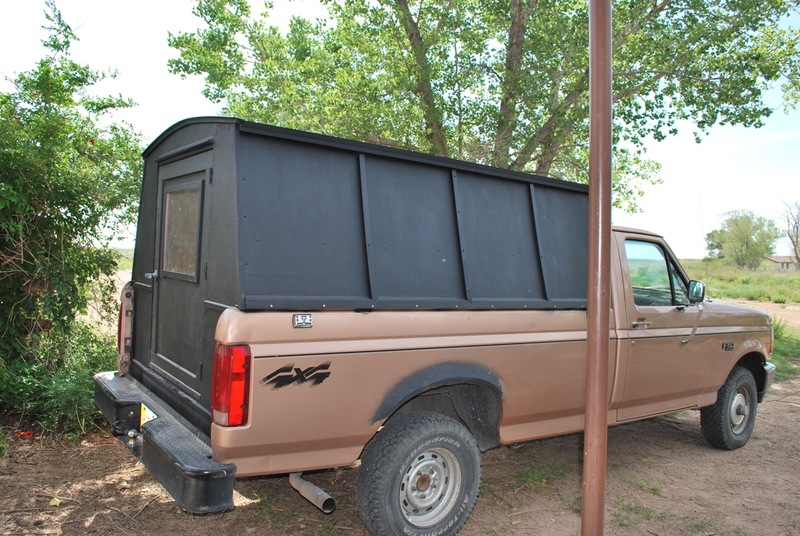 The sides are dark bronze and the roof is reflective “snow roof” to keep down the heat. Its actually 16 gauge galvanized sheeting. This should provide a low-budget protection from the elements. The seams between sheets are covered with 1/8″ thick, 2″ wide aluminum strips sealed with flashing caulk. The whole thing is primered with aluminum/galvanized primer and painted with Rustoleum enamel. 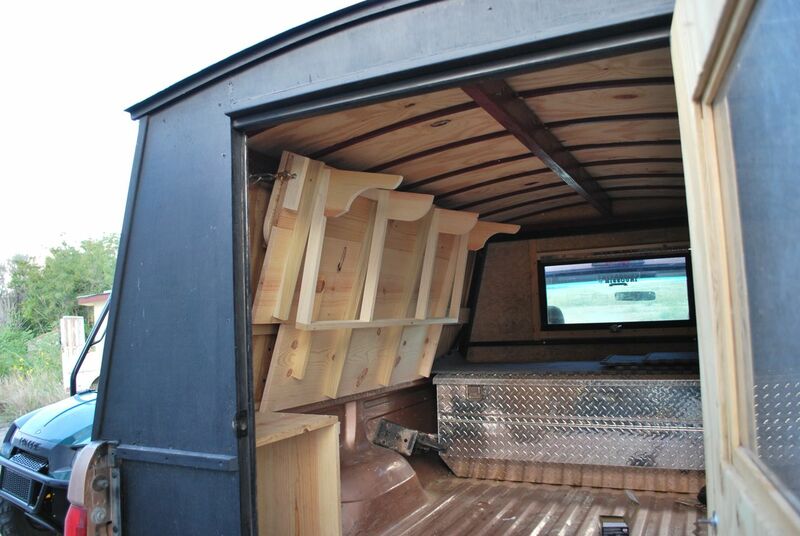 The bed is constructed at the same height as the tool box to provide plenty of space to spread out. The spare tire and jack take a fair amount of the free space but it is handy to get to these when needed. I went back to a dark color as the main color for the sides deciding to be a bit more incognito. My husband wants to know how much you spent on this, roughly. The rear window on his topper just fell out, again; time for a new truck topper. Really kewl; I love it. Ah yes the ultimate travelling machine. i know quite a few people who have done this to tour North America. It beats paying for hotels every night that your on the road. Ah yes. Its nice to just be able to undress and stretch out for a few hours sleep for free whenever you want. It was great when I used to travel more. Now I have the full on wagon for big trips. This is amazing. Thank you for documenting your innovations. I’d like to build this and have a couple questions: Did you weld the frame yourself? are the 2x4s running front to back wedged between the steel, or how are they secured if the panels are nailed to them? how much time and money did this run you roughly? Thanks for the comments. Yes, I welded the frame. The 2 x 4s were just stiffeners and allow for hooks, shelf, etc. Time; maybe a week of evenings. Money; you would do better just making a list of what you need, getting on a website like Lowes or HomeDepot and calculating it yourself. Mine was a mix of stuff I had lying around and some purchases so might not apply. Good luck on yours! 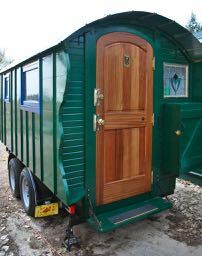 I like this idea and am planning on building your “gypsy wagon” pretty soon. It’s terrific. But, I don’t have any idea where one can spend the night for free in your camper/gypsy truck camper. Info please!!!!! Thanks, great blog, by the way! BLM, Forest Service, State Forests, side of the road, even pay campgrounds. I’ve been in all of them. out here where im at in California you can park for free at most Walmart parking lots, side of the road like at beaches, many industrial commercial areas (mainly businesses) that have no limit to length of parking, deserts side roads. Hope this helps. I am interested in the wood camper shell. I would like one for my truck. I have a little Toyota truck could you either tell me how to make one or build one and I’d buy it. Depending upon what you want, it can be pretty simple. Where are you located? 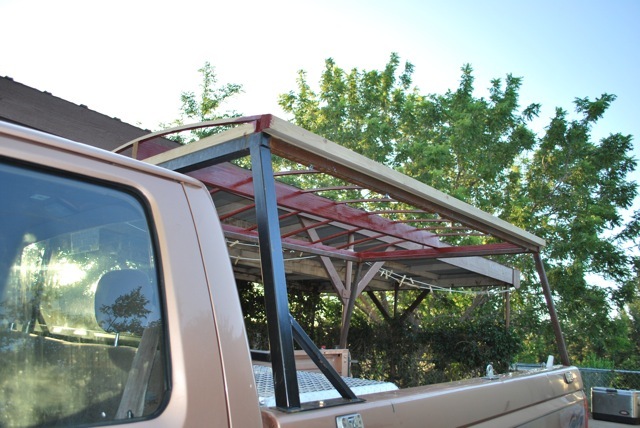 My Tacoma Topper is three frames covered with wood and having roofing felt under waterproofed tarp over the outer top. Have a look here: https://paleotool.com/2014/03/22/wooden-truck-topper/ I’m actually not using that one any longer as I need a rack more often than not. Depending upon where you live, maybe you would want it? Yikes! That’s a good ways from here. I’m in eastern New Mexico but I love that part of California. I’m sure you can find someone close to help you out. 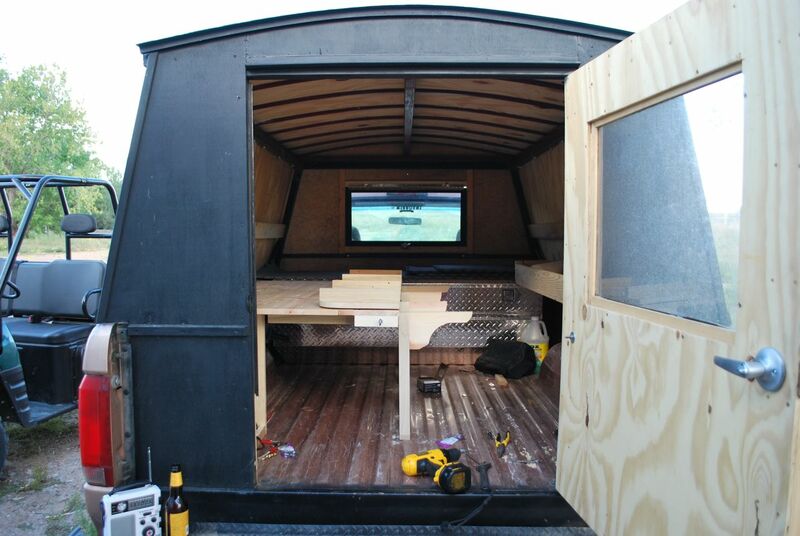 Good job on the camper! I’l be building one like it so I hope you don’t mind a few questions? 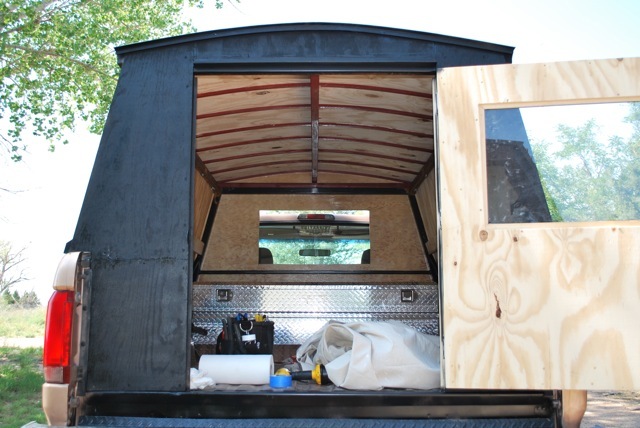 I’m worried about water and air leaks, so I’m wondering how you sealed the edges of the back wall and metal truck body, the edges of the roof and walls, and the bottom of the walls and the truck rails, against this? Did you use foams tape, some other kind of gasket, or a caulk of some type? Also very curious how the roof ribs are attacked to the sidewalls? And how is the whole thing attached to the truck? I’m sure all this is obvious, but not to me! Thanks! The Tacoma offers some real challenges for attaching a topper. The bed is a composite plastic with very little substantial metal to attache to. However, there is a rail around the inside of the bed that is solid, for attaching tie downs, etc. I used steel Simpson Strong Tie straps from the big box store, bolted to the inner rail then to the lower rail of the topper. The seal is made with standard topper seal that comes in tape form but, of course, Toyota has to be annoying so the front edge is about 3/4 lower than the side rails meaning the front edge has a small extra board attached to fill this gap. You may not have this on other trucks. 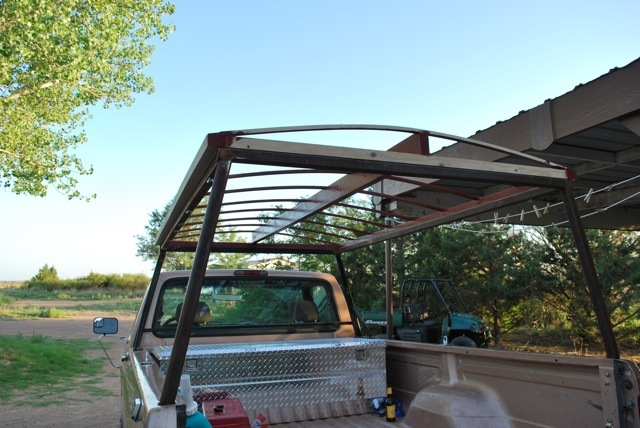 The ribs are a solid frame that is built first, then everything is attached to it so it is like a stud on the side, attached to the bottom rail (2 x 4) with the roof support glued and screwed to it. Whoops! The above answer, which I’ll leave for posterity, applies to the newer topper on the Tacoma. To answer Frederick, this one is built around a 1 1/2″ steel frame dropped into the stake pockets! Easier than the Toyota. The top rail of the sides has a wooden wedge bolted to the top that the ribs are attached to. everything else is pretty much as above. 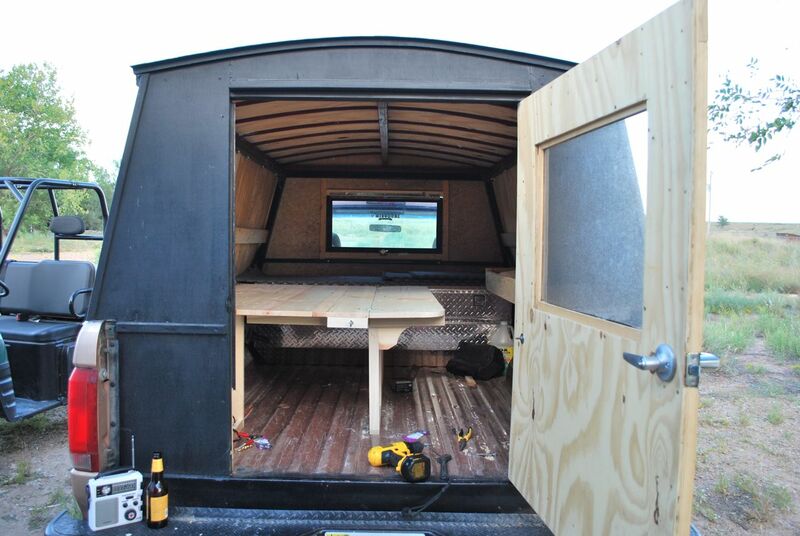 I built one extremely similar, had it almost twenty years (on two different trucks). My brother called it my gypsy box, hilarious! 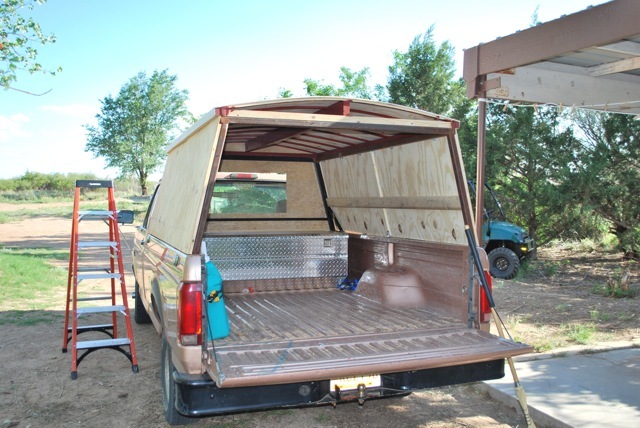 Mine was not metal clad, I had to change out the plywood sheeting several time and the entire wood frame twice. Upkeep was a constant battle, but I went everywhere in that ‘gypsy box’! We all know we can park at Walmart’s, but a friend came up with a hospital parking lot as the best free location.